Welcome to February! I hope it’s treating you well, and that it is neither excessively hot and sunny nor excessively cold and dark in your part of the world (February is a month of extremes, I think). It’s been another fairly quiet week for me and my writing. The first chapter of Nadya met with middling success on Wattpad, catapulting briefly into the top #100 in its categories and then disappearing from them entirely. This neither surprises nor dismays me; it simply reinforces to me that I do not understand how Wattpad’s rankings systems work, and that I am rubbish at capitalizing on them. Soulwoven, meanwhile, has crossed the 150,000 reads mark, and I have at long last put up the Aleani Language Primer. For those of you who are interested, it can be found at the very end of the book, and it will allow you to translate every Aleani phrase in the book into English if you so choose. More exciting news is afoot with Three Dances. I spoke with my copy editor, and the book will be returned in edited form to me this week. This. Is. Exciting. Because once it’s come back to me, I’m literally only about two snafus in page design away from having it ready for publication. And once it’s ready for publication all kinds of exciting things can happen, the most exciting of which is that it will be published and available for human consumption by whichever humans choose to consume it. I hope some of you will be among them. That’s about all, for now. 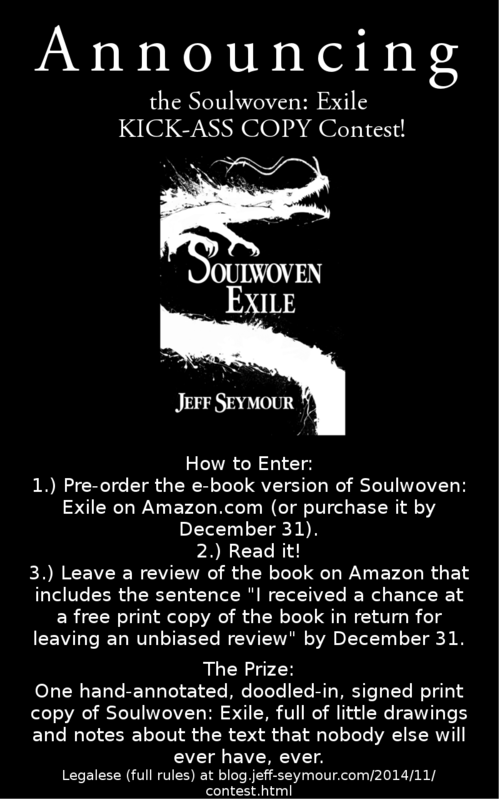 I am going to begin work on overhauling Soulwoven: Exile tonight. It frightens me, because it matters to me, and because I am afraid of somehow hurting it when I go back in to fix it up and make it better. This fear, so far as I can tell, is a good and normal thing. But I still hope that at some point, it goes away. All best as always, friends and readers, and happy month of extremes.